You are here: Home / Tori's Kitchen / Food for Thought / What Kind Of Matzo Balls Do You Prefer? It’s a rainy, blustery day here in Los Angeles… the perfect day to fix a piping hot bowl of soup. It’s got me contemplating matzo balls. Matzo ball soup is a quintessentially Jewish dish; it’s comforting and delicious. In tomorrow’s blog, I’ll talk about different ways to make a flavorful chicken stock for soup. But today, it’s all about the matzo balls. When it comes to matzo balls, there are two schools of thought. Some people like them small, firm, and dense. Others prefer light, fluffy, larger balls. Based on my own bit of unscientific research, the matzo ball preference of most Jews depends on their own mom or Bubbe’s soup recipe. If Bubbe made dense matzo balls, there is no other way. It’s Bubbe’s way or the highway. So what do I prefer? By far, I’m a fan of lighter, fluffier matzo balls. For those really light a fluffy matzo balls, I use Manischewitz Matzo Ball Mix. I’m not talking about the pre-made matzo ball soup in a jar. I use the dry mix for the matzo balls only, and make the soup broth from scratch. I’ve tried plenty of matzo ball recipes in the past, and they just don’t compare to Manischewitz. It turns out perfect every time… no headache, no fuss. When making matzo ball soup, I prepare them in a way that makes them even more delicious. Many cooks will cook the matzo balls in boiling water, then add them to the soup later. I like cooking them directly in the boiling broth. That way, they soak up the flavor of the soup, complimenting the flavor of your carefully prepared stock. Tomorrow, I’ll share some stock secrets with you to make sure every pot of chicken soup is a success! What kind of matzo balls do you prefer? I use the Manischewitz Matzo Meal for my matzo balls. The changes I’ve made are 1) instead of veg. oil I use the fat I skim off the soup instead. I freeze the fat and save it for many things. 2) I use my own broth instead of water, too. 3) Generally, I’ll cook them in a pot of boiling water that I’ve seasoned with chicken bullion cubes or salt. That way your broth is always clean and ready for whatever you want to use it for. I love the Manishewitz Matzo Balls. Been my ‘secret’ for years! I add a dash of nutmeg and some chopped parsley to the mix. Youngest grandson (9) fancies himself as a Matzo Ball maven and says mine are the best. Smart kid! I always make matzah balls from scratch — light and fluffy if I can. This year, I am adding leeks and ginger them. Chicken soup also from scratch. It’s a bit time consuming, but so much better than the prepared stuff. The soup cooks while I watch the NCAA. It’s a win-win. 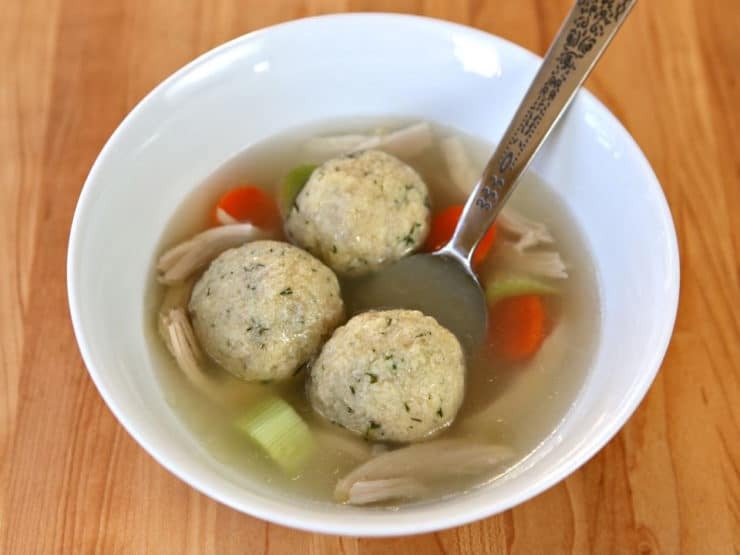 Great idea on cooking the matzo balls separately… as long as the chicken broth is MSG-free, as you indicated in another post! Osem makes an MSG-free chicken powder that is pretty tasty, though I don’t think they make an MSG-free version that is kosher for Passover. I also like the organic free range broth from Trader Joes! I pretty much always use Manischewitz these days. I used to make it from scratch, but using the mix makes it faster. I have always traditionally cooked the matza balls in the soup, but I have since stopped doing it for two reasons. Number one, we now have gluten free eaters often in our home, so if I cook them in the soup they dont want the soup. Number two, if you cook in the soup, the amount of soup you have in the pot will dramatically lessen. 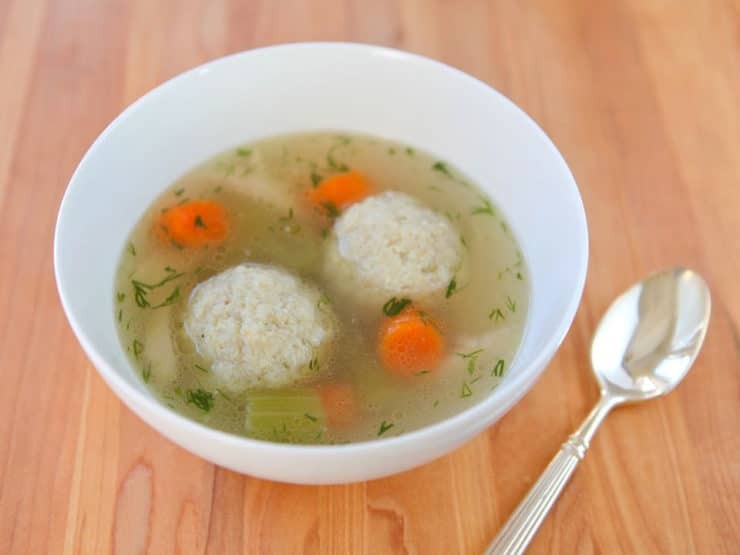 Since we often have guests who do not eat the matza balls, I want as much soup as possible. So what I do is take a separate pot and in that pot either use commercial chicken broth, or make a mix of a little of my soup with some commercial broth and cook the matza balls in that. Still get some of the taste in the matza balls, and no gluten in the soup. BTW, I am loving the blog and and I reading from beginning to end right now. I am an avid amateur kosher chef and I am loving your recipes. I will add one to your contest soon too! Me too Jeff! You and your wife can try carrot soup with matzo balls, I’ve heard it’s good… haven’t tried it yet.